We are excited to announce that John Kania, a preeminent nonprofit and corporate consultant and author of highly-regarded books and articles on social change, has joined New Profit as an Executive in Residence. 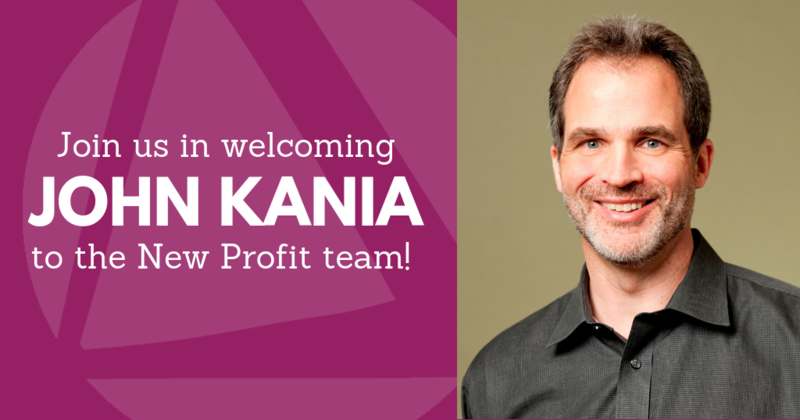 In this role, Kania will bring his expertise in systems change to help New Profit build its practice supporting and growing entrepreneurs on the path to systems change over the next year. "Anyone who has worked with John knows what a huge impact he will have as a member of our team," said New Profit Founder and CEO Vanessa Kirsch. "John's expertise on systems change and what it takes to disrupt the conditions that hold big problems in place will be central to our efforts to increase our impact in the coming years." Keep reading to learn more about Kania's dynamic leadership and deep experience working across sectors, and please join us in welcoming him to the team! John will be an Executive in Residence at New Profit for the next year, helping New Profit to build its presence and practice in systems change. Most recently John was Global Managing Director at FSG, a non profit consulting firm supporting leaders in achieving large scale lasting social change. As Global Managing Director at FSG, John led the firm for 18 years, consulting with clients in a variety of sectors including education, health care, global development, community development, and the environment. He also speaks and writes extensively on accelerating social impact and systems change. John is co-author of the book, Do More Than Give: The Six Practices of Donors Who Change the World. He is also one of Stanford Social Innovation Review’s most frequently published authors, with recent articles: Collective Impact (2011), Strategic Philanthropy for a Complex World (2014) and The Dawn of System Leadership (2015). John just released a new article, The Water of Systems Change (2018), which helps practitioners to identify the highest leverage points in creating change within their system. Prior to joining FSG, John was a partner at both Mercer Management Consulting and Corporate Decisions, Inc. (CDI) consulting to corporations on strategy. He began his career as an advertising executive with Leo Burnett Company. John has an M.B.A. from Northwestern's Kellogg Graduate School of Management and a B.A. from Dartmouth College. He currently resides in Lincoln, MA with his wife Holly. John has three grown children.